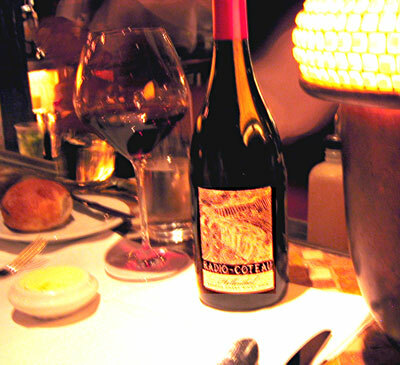 A very elegant and classic pinot that is refined but gives generous dark cherry flavors and spicy cedar notes. It has a great balance of acid, fruit, and body, which I think is so important for enjoying a wine with a meal. Beautiful and delicious! I had not heard of the winery, but picked it on the merits of the vineyard, Hellenthal, which I consistently enjoy. Yummy, yummy. The bartender (we ate at the bar, because it's just such a cooler scene) had tasted through the whole line and told us that the winery also produces a great Syrah and Zinfandel.